This is a common orthopedic condition in small-breed dogs. The knee cap or patella slips in and out of the groove at the bottom of the thigh bone. Depending on the severity of the disease (there are four stages), the condition can be obvious or rather subtle. When the kneecap is inside the groove, there may be no lameness; when it’s out of position, you may see a pronounced limp. Your veterinarian can feel your dog’s knees and explain the severity (the stage) upon examination. Surgery may be recommended when the limping is consistent or if your veterinarian simply wants to slow down the progression of arthritis that will slowly build up as a result of medial luxating patella. This strange disease leads to weakness, then fracture of the hip. Treatment involves surgery to remove the ball of the hip (Femoral Head Ostectomy or FHO). Click here for more on Legg-perthes disease. A disc hernia can occur in any size dog. 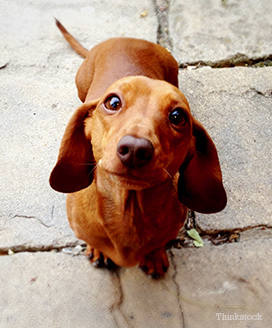 However, it is much more common in small-breed dogs—dachshunds in particular. Slipped discs can be seen anywhere in the spine: most commonly in the mid or lower back, and occasionally in the neck. Back or neck pain, weakness in the legs, paralysis and difficulty turning the head are some of the signs to look for. This is a true emergency situation. Atlantoaxial luxation is a malformation of the first vertebrae in the neck. This leads to pain and neurological abnormalities, which range from weakness to paralysis. Liver shunts are a genetic condition mostly seen in young, small-breed dogs. Normally, blood (which carries nutrients from the intestine) is filtered by the liver. One of the jobs of the liver is to eliminate toxins in the blood. A liver shunt means that the blood bypasses the liver and goes directly to the heart. From there, it goes throughout the body, unfiltered. As a result of the toxins, dogs with a liver shunt have neurological signs, including seizures. Small breed dogs are commonly presented to the veterinarian or the ER after getting attacked by a larger dog. It is wise to be very cautious around larger dogs. Click here for more about avoiding dog bites. Unfortunately, fractures are common in small breed dogs: smaller frames mean fragile bones! Jumping, getting stepped on, tripping, getting dropped and falling down steps are all reasons we see small-breed dogs for fractures. Blood vessels in the legs of tiny dogs are different than in their bigger buddies; many fractures will not heal with a splint. Therefore, small dogs typically need surgery to repair the break. Difficultly giving birth and needing a C-section is common in small-breed dogs. The reason is that the pelvis is sometimes not able to handle a natural birth. 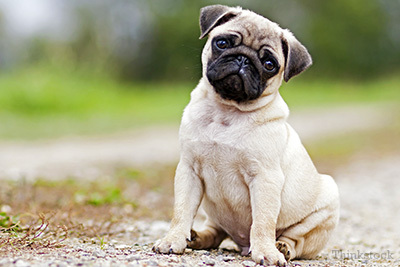 This is especially true in dogs with a flat face (or a brachycephalic face) such as pugs, who tend to have larger heads. “Water on the brain” is a disease where excessive fluid accumulates in the brain. At worst, this leads to seizures, blindness and dullness. Dogs with a collapsing trachea have a weakness in their wind pipe. During the early stages "episodes" mostly occur when the dog gets excited. Treatment includes medications, weight loss, etc. As the disease progresses, the dog can have difficulty breathing, even at rest. At this stage, surgery is required. Some of these conditions can be detected early, so it’s a good idea to take your small dog to your family veterinarian and try to detect them as soon as you adopt.